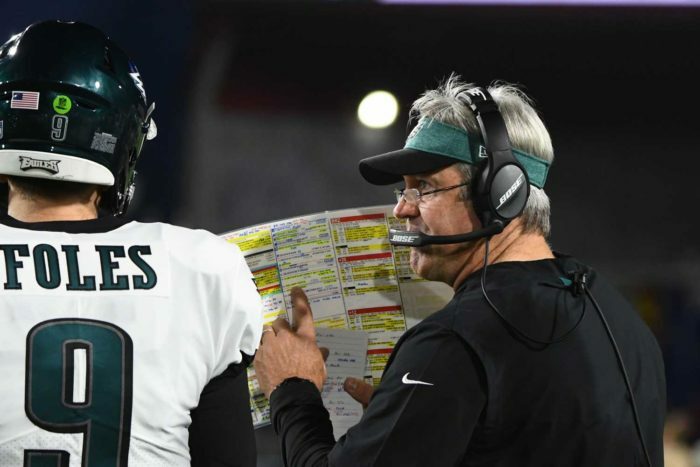 Doug Pederson and the Philadelphia Eagles have done an admirable job of salvaging their season after that embarrassing loss to the New Orleans Saints a month ago. Since the 48-7 defeat, the Eagles have won three of their last four, including a huge win on Sunday night against the Los Angeles Rams. Not only did they beat the potential number one seed in the NFC at their home, but they did it again with the heroics of backup QB Nick Foles. Pederson and his team deserve credit for their game planning and execution. However, this is not why Pederson is featured in this week’s Situational Call. Yes, he gets kudos for the Eagles upsetting the Rams, but he risked losing it at the end. The Eagles led 30-23 with 1:13 left in the game when a possession stalled at the Rams 35. Los Angeles was out of timeouts. Facing fourth-and-9, Pederson had a decision to make. His options: attempt a 53-yard field goal, pooch punt, or go for it. A Jake Elliott field goal would essentially end the game. If he missed, however, the Rams would take over at their own 43-yard line. Elliott made his mark as a rookie last year with several big kicks from long distance, but he had only made two of his five attempts farther than 50 yards this season, with his longest coming from 56. If Pederson opted for a pooch punt, it would back the Rams up and force them to drive the length of the field for a game-tying touchdown. Another option would be to go for the first down, which would also seal the game if converted. Even if they didn’t convert, as long as it wasn’t a negative play, it would have run time off the clock and set up the Rams at their own 35 or deeper (as opposed to the 43). Given Pederson’s track record with going for fourth downs, it was somewhat surprising he elected to go for the field goal. Elliott’s kick missed wide right and the Rams took over from their own 43-yard line with about 1:08 left to play. Jared Goff hit check down after check down until they finally reached the Philadelphia 18-yard line with four seconds left. Fortunately for Philly, the Rams were unable to get out of bounds on several plays which shaved extra time off the clock. Goff airmailed a pass intended for WR Josh Reynolds in the end zone on the final play of the game to seal Philadelphia’s win. The results favored the Eagles, but it was closer than it should have been. Attempting the field goal risked too much. The Rams offense has been struggling of late, but they had scored 10 points in their previous two possessions, so it wasn’t great giving them the ball with favorable field position. Fortunately for the Eagles, they escaped L.A. with a much-needed win to bring them within one game of the NFC East lead. The reigning Super Bowl champions take on another first-place team in the Houston Texans at Lincoln Financial Field on Sunday.